Photo and story by Amy Budnowski , Alex Riley, Abbey Swasko, , Emily Nixa, Nicole Jaworski, Nikhil Naik, Samuel Markwardt, Kao Seng Thao, Samantha Tripp-Greenman, Dr. Melissa Schoeffel, Lecturer “I liked to think that in some small way I was doing my part to preserve some of America’s past. Now I have a more exciting job. I’m cleaning up after America’s future.” These are the words of Jim Hawley, a longtime Riverwest resident who worked at several art museums and now works as a custodian at UWM’s RiverView Residence Hall. “One of the ironies of my job as a custodian is that I occasionally clean up my own artwork,” he observes, as Jim designed the logos of Pizza Shuttle, Sprecher Root Beer, Theater Sports, the Art Smart character for Art Smart’s Dart Mart and the Captain Install superhero on the garage door at 2231 N Humboldt. He’s also drawn cartoons for Sears and Microsoft. Jim came to Milwaukee from Chicago in 1966 to attend Layton School of Art, which later became Milwaukee Institute of Art and Design, because their entrance application simply required the submission of ten drawings and a letter of intent. He wanted to be an artist because he felt confident in his ability to produce art he thought was worthy of being displayed in a museum. After he graduated, he spent a year refusing to use money as a protest against the draft for the Vietnam War, instead bartering his artwork for services and goods that he needed. He eventually gave this system up when he realized how selfish it was to ask others to comply with his vision. He met his wife, Paula, who was a receptionist at the Milwaukee Art Museum where he was working as a projectionist. He labels their love a “peculiar romance,” not “love at first sight,” but a certainty that they would be together, romantically or not. They first rented a property on Booth Street in 1979 and moved frequently throughout Riverwest and the East Side until 1992, when they bought their house on Pierce Street. 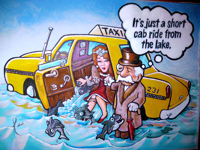 Before they bought their house on Pierce, though, Jim purchased a home for his business, using his skills in art to create advertising signs and posters for local businesses. The company began as “Dead-End Advertising” and later became ACME. The ACME building is a familiar landmark at 804 E. Wright St. 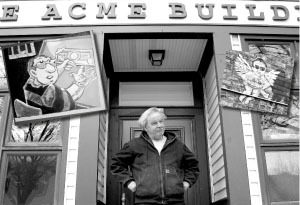 While ACME was successfully making its mark on the future of local businesses, Jim involved himself with ESHAC (Eastside Housing Action Committee), doing freelance illustrating for the ESHAC Newsletter, and painting signs to advertise the organization’s intent. This non-profit organization assisted first time homeowners and small businesses, and also developed a successful anti-drug program for which Jim designed the logo. Jim’s involvement increased his sense of community and overall inclusion in the Riverwest neighborhood, which he calls the “most political neighborhood in the city,” because there’s a lot of activity, and everyone is interested in something. In 1998, Jim retired from his ACME business, because his goal had been met. Jim wanted to “give tangible value to [his] artwork,” an objective that had been accomplished through ACME – so much so that now he picks up pieces of his artwork on brochures and such in the RiverView hallways. Although he left the business, his pen and paint are still readily in hand. After ACME, Jim started work as a caretaker for the Charles Allis and Villa Terrace Art Museums, where the small staff meant that Jim had plenty of variety in his work. When Scott Walker was elected, budgets were cut, and Jim was one of the first to go. This layoff resulted in a loss of health insurance, which did not bother Jim and his wife until he suddenly suffered a heart attack in 2004. During his subsequent stay in the hospital, Jim looked out the window, saw UWM, and realized that it would be a perfect place to work. UWM would provide him with health insurance and enable him to work near his community. When RiverView was built he transferred there because he saw it as a great opportunity for living, working, and participating in the Riverwest neighborhood. One of the perks, he notes, is being able to walk down the trail every morning that connects RiverView to Gordon Park on his way to work. Although Jim says that he does not have the energy he used to, he enjoys working around students at RiverView. Jim feels they bring energy to the Riverwest community. And although he is not as active in the community as he used to be, he still cares about what he does and about the people who are living here. To him this is not just another job. It offers a way for him to stay involved and present in the community that he loves. If you did not really know Jim, you would think that he is just another ordinary guy. He’s not. He’s found purpose, a meaning, and happiness in his community and his work. We are glad he’s here. This story was written by a Living Learning Community as part of the Cultures and Communities Program at UWM’s RiverView Residence Hall.